For me, Gardening is mindful, being in the moment. It doesn’t have to be me ‘doing’ things, it’s about the scents, the rustle of leaves, the birds, the hum of lawn movers in the distance. For me, when I’m in the garden, I’m in the moment – I find watering, deadheading and weeding relaxing – and planting too. For me, it’s about peace and recharging. About my garden – it’s small, it’s rubbly soil and north facing; the neighbour’s have huge conifers, which make it even more shady at the end of the garden. I’m content in the garden. My garden is a work in progress – like me. I’m 51 – I definitely feel I’m in a new chapter with My Chap (my new husband) holding my hand, metaphorically too. To be fair, he does all the digging and heavy work as I have osteoarthritis. It’s a team effort in the garden. and there’s always time to eat and relax. Many pots planted (and watered), and always Yoda – any season… Yoda (and Star Wars have appeared many times on this blog). I love lavender too – it figured very heavily at our wedding in September 2017 (it was our ‘confetti’ too) I have about 20 different plants around the front garden which gets sun all day. Many crocuses and violas too. Always something for the birds too. It’s not all purple flowers though – there’s lots of colour around the garden. Orange and yellow life my mood in Spring. I love tulips too. What do you do that’s mindful? Originally, I wrote about what my garden means for me for the April competition at Cottonopolis Women’s Institute. We were asked to suggest our mindful activities, there was a vast range including knitting/crochet, sewing, baking, art or drawing, listening to music, and a few people like me loved walking or being in the great outdoors. Our speaker in April was Deb Connor – an all-round star who led some mindfulness exercises and stretches. She’s a trained mindfulness teacher, an acupuncturist and is a vegan too. We have such alot of fun at WI meetings, in June we made beauty products from lavender, peppermint and coffee skin scrubs. Our next meeting on Tuesday 3rd July (730 at St Micheal’s George Leigh Street, Ancoats, Manchester) is tea tasting. I can’t wait. Let me know in the comments what you do that’s mindful? Do you have a garden? What does it mean to you? This entry was posted in Gardening, Health and Wellbeing and tagged Gardening, growth, lavender, mindfulness, Pimms, Primula, viola, Women's Institute, yoda on June 7, 2018 by Bec - views from my garden bench. 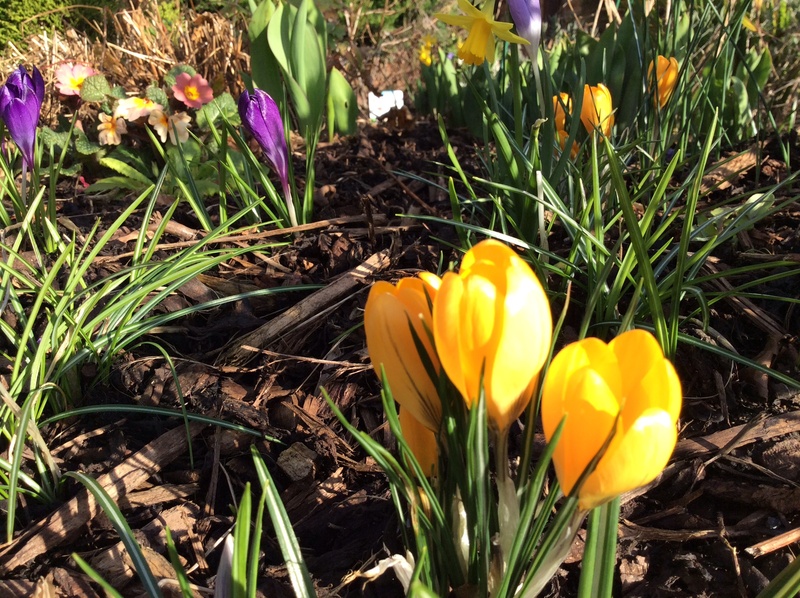 This entry was posted in Gardening and tagged crocus, pansy, Primula, spring on February 28, 2018 by Bec - views from my garden bench. Today is the first day of Spring, International day of happiness and a rather cloudy solar eclipse (more about that soon). I was working at home today, due to a long and boring electrical saga at work. There’s more flowers out in my garden including these primroses (primulas). Primulas like a semi-shady spot; they’re happy under trees but don’t like the soil too soggy. Mine are along my left hand fence in my north facing garden so don’t get any afternoon or evening sun. Primroses are traditionally yellow or shades of cream, but now the hybrids come in many colour combinations – yellow and purple, crimson and yellow for example. I’ve got some really pretty salmon pink and yellow ones in my front garden. i’ve been planning more adventures – watch this space. All In all, a very good day, and I have a pint of Pimms too. 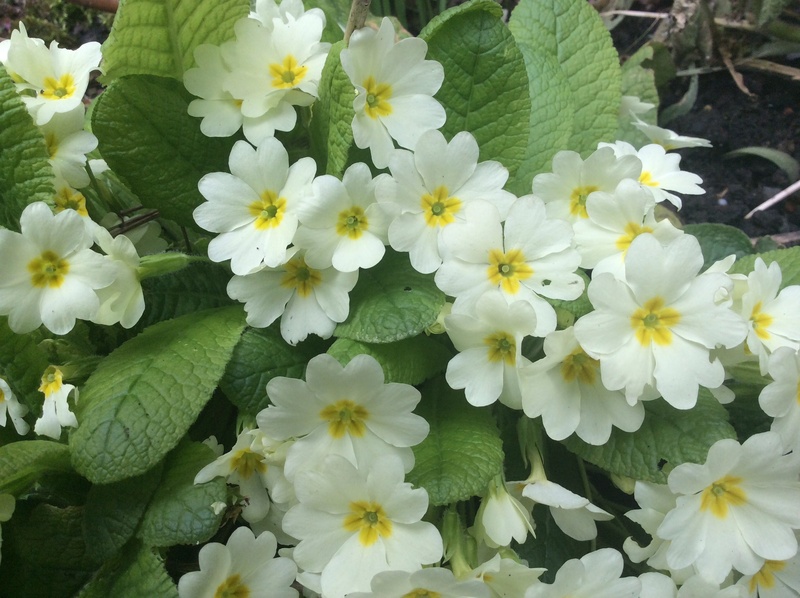 This entry was posted in Food and Drink, Gardening and tagged adventures, Gardening, Pimms, Primula on March 20, 2015 by Bec - views from my garden bench. This entry was posted in Gardening and tagged crocus, Primula on March 11, 2015 by Bec - views from my garden bench.